The B-52 is capable of dropping or launching the widest array of weapons in the U.S. inventory. The B-52 made the longest strike mission in the history of aerial warfare during the Gulf War, flying 35 hours non-stop. In a conventional conflict, the B-52 can perform strategic attack, air interdiction, offensive counter-air and maritime operations. During Desert Storm, B-52s delivered 40 percent of all the weapons dropped by coalition forces. It is highly effective when used for ocean surveillance, and can assist the U.S. Navy in anti-ship and mine-laying operations. Two B-52s, in two hours, can monitor 140,000 square miles (364,000 square kilometers) of ocean surface. Starting in 1989, on-going modifications incorporates the global positioning system, heavy stores adapter beams for carrying 2,000 pound munitions, and a full array of advance weapons currently under development. 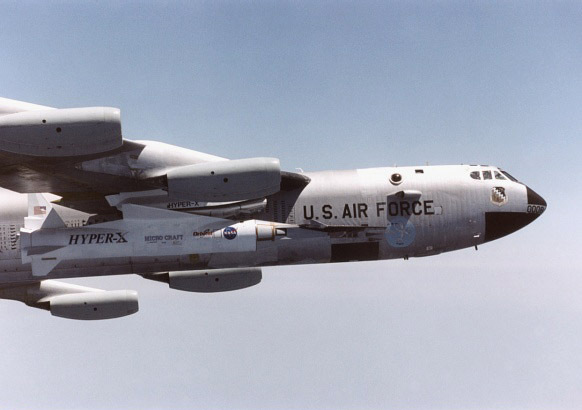 The use of aerial refueling gives the B-52 a range limited only by crew endurance. It has an unrefueled combat range in excess of 8,800 miles (14,080 kilometers). The aircraft's flexibility was evident in Operation Desert Storm and again during Operations Allied Force. B-52s struck wide-area troop concentrations, fixed installations and bunkers, and decimated the morale of Iraq's Republican Guard. The Gulf War involved the longest strike mission in the history of aerial warfare when B-52s took off from Barksdale Air Force Base, La., launched conventional air launched cruise missiles and returned to Barksdale -- a 35-hour, non-stop combat mission. .
During Operation Allied Force, B-52s opened the conflict with conventional cruise missile attacks and then transitioned to delivering general purpose bombs and cluster bomb units on Serbian army positions and staging areas. The B-52 first entered service in June 1955, now only 2 versions remain in service with its successor, ACC. A total of 193 J57 powered B-52G were built with integral wing tanks and short fin, and armed with four 0.50-in machine guns. In desert Storm, all missions were assigned to the G model, operating as free-fall bombers. The B-52G is well protected by numerous ECM systems, and 2 under nose 'blisters' house LLLTV and FLIR sensors - used with the terrain avoidance radar to provide low-level penetration capability. Some B-52 were used in many aircraft testing as motherships to carry them up to testing altitude, such as the X-15 program.